An exciting new earring with sparkling cz leaves, secured by a 4mm pearl stud. A distinctive new earring with a little button pearl on a unique design with sparkling cz leaves, secured by a 4-5mm pearl stud. The pearl stud can also be worn separately. 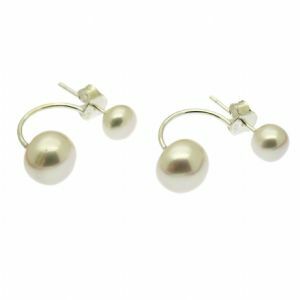 A fashionable new take on the classic pearl earring. Also available in black.